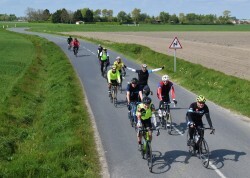 Come and join our London to Amsterdam bike challenge - taking just 2 days riding in total, with one day to return home, you’ll be covering around 150 miles - just enough to blow the cobwebs away - or stretch yourself to the limit - depending upon your fitness level! This is an ideal itinerary for those embarking on a first cycling challenge - as the hills are very few and far between and much of the route in Holland is on off-road cycle paths! From our start location in central London, we begin steadily riding from the the busy London suburbs and it’s not long before we are clear of the urban sprawl and out into the Essex countryside and riding on to the historic towns of Chelmsford and Colchester. We will do our best to take the prettiest (and quietest) roads we can find as our route through this picturesque county, however, we should also be prepared for just the occasional tricky junction or busy stretch on this 85 mile day. Our final destination town for the day is the port town of Harwich and the point we join our ferry and overnight quarters. Before boarding we will have time to take dinner at a local restaurant after which you will be able to freshen up in your en-suite cabin. After our overnight journey on the ferry we arrive at the Hook-of-Holland - now the fun begins - we begin cycling the bike friendly countries of Europe... pedalling our way along the multitude of traffic-free cycleways and canalways of Holland. Cruising without the complications of traffic control the scenery quickly changing between urban and rural as we pass through towns and countryside we can expect to make good progress through the day and arrive in good time for well deserved refreshments and celebrations. The final day will be for you to enjoy the sights of Amsterdam - We will drive your bikes back to the UK for you to be reunited on your return. 14:00 - arrive amsterdam train station for train to Schipol Airport - this is optional you may wish to take a taxi. 16:45 - approx arrival time into London Gatwick to meet your Adventure cafe team and be reunited with your bikes. We will be using twin or triple rooms through the challenge. We will spend night one in a ferry cabin - compact and cosy but good enough to give you a good nights sleep. Night two will be a little more spacious using a 2/3 star hotel close to Amsterdam city centre - nothing palatial - but not too bad either! Single rooms are available upon request (subject to availability).Please Note: there will be a single room supplement (SRS) for this service. For a detailed kit list, please click HERE! To view a 16 week training plan to get you in shape for the ride, please click HERE! For information on the suitability of your bike for this challenge, please click HERE! For tips on how to stay safe on the roads to Amsterdam, and in your training, please click HERE! Weather conditions very similar to the South East of England - dependent upon time of year could be cold, hot or rainy. Prepare for all conditions.